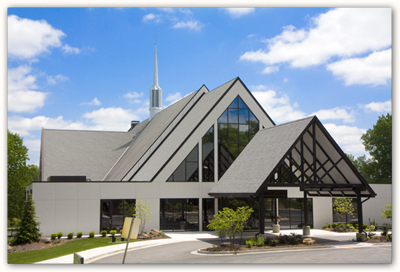 Our church building was completed in 1966, and a narthex was added in the 2009. (See the photo gallery – link at right – for 2009 construction photos.) See the history page for more. Also see additional pages under this one on the menu at left. 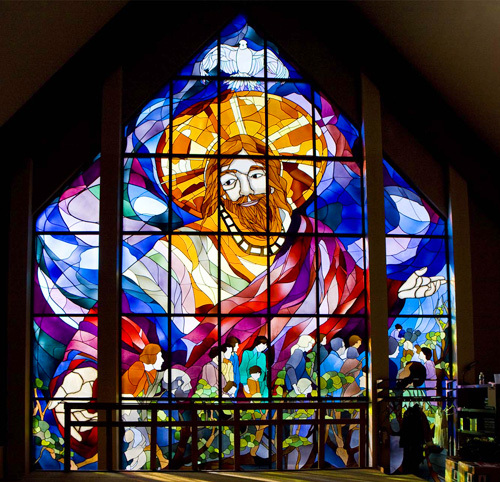 The set of three stained glass windows have been designed to honor the Lord while calling to mind aspects of His life and the history of our faith. 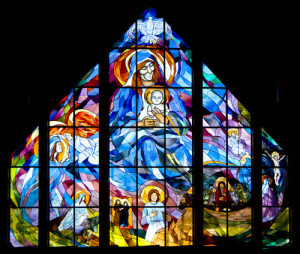 Each window has an individual theme.The direction of artistic flow common to all the windows is symbolic of the graces that flow from the Holy Spirit to us and the love that we return to the Lord. In addition, the direction of flow in the North and South windows is toward the altar where the sacrifice of the Eucharist takes place. Here’s a downloadable/printable color-able version of this window! 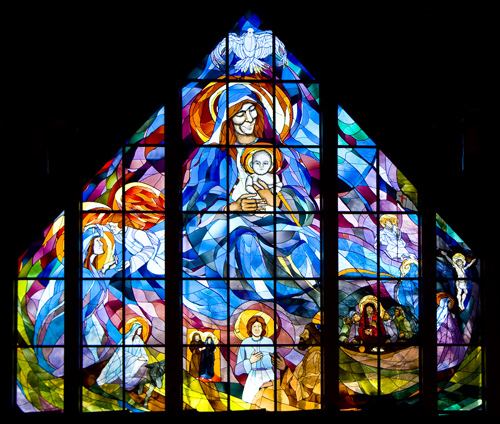 The North Window, with its consistent and even light, is symbolic of the constant love that flows between Jesus and His mother Mary and on to us. The central figure of Mary is the symbol of the way we should all respond to God – living a life of surrender to Him. Events pictured in this window begin with the Annunciation. We see her traveling to Bethlehem where her Son will be born. Next we see Mary with St. Joseph as they find Him in the Temple listening and questioning the teachers. We next see Jesus and His disciples celebrating the Last Supper. The widowed Mary is then shown at His crucifixion and the last scene shows us His resurrection. This window reminds each of us the fullness of redemption and of our call to live forever and share in His glory. 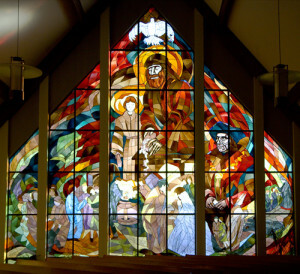 The South window is the family window with the strong light illustrating warmth and love. The central figure is of St. Joseph,teaching his trade to the young Jesus. The neighboring figure is of St. Thomas More–a heroic family man who lived in turbulent times, and was subsequently martyred for the defense of his faith. The encircling scenes typify the pilgrim people of God ourselves – seeking to participate in the community of faith according to their own talents. Some will serve in the religious life, others will serve in the lay community. A girl meets a boy. they marry before the altar and baptize their children in the Faith. There will be many family gatherings, shown held before an open door, which depicts the door of open-mindedness and forgiveness which should always be kept open within any family. The next generation is shown walking into the world and, thus,the cycle continues.